SmallestDotNet – SmallestDotNet.com is a single page site that does one thing. It tells you the smallest, easiest download you’d need to get the .NET Framework on your system. Even on Mac OS X it is helpful and recommends Mono and on iOS it recommends looking at MonoTouch. Thanks Scott Hanselman for making this available! What version of the .NET framework is installed on Windows XP, Vista, and 7? – Stack Overflow. Error 13EC when installing The .NET Framework 4.5.1 means you need to free more disk space. 3GB that is. Recently I had Windows Update giving me a 13EC error when installing KB2858725: The .NET Framework 4.5.1 that got release lated last November on various virtual machine systems. It appears that a lot more people suffer from the Windows Update 13EC issue, and most of them have to to with .NET 4, .NET 4.5 and .NET 4.5.1.
taking a huge C:\Windows\WinSxS\Reserve.tmp file (the Reserve.tmp is almost 3 gigabyte on my various Windows 8 VMs), but that 3 gigabyte boundary seems to ensure that future upgrades can be installed. Note there are some Microsoft tips to make the size of the C:\Windows\WinSxS smaller, but those still do not remove the Reserve.tmp file. My conclusion is that various Microsoft updates now require 3 gigabytes of disk space. This seems to be the case with the .NET Framework 4.5.1 KB 2858725 update, and probably more future updates. I tried installing the KB 2858725 update with slightly less than 3 gigabytes of space (and after the 3 gigabyte reserve.tmp appeared), and I was still getting error 13EC. But with slightly more than 3 gigabyte the update would install. 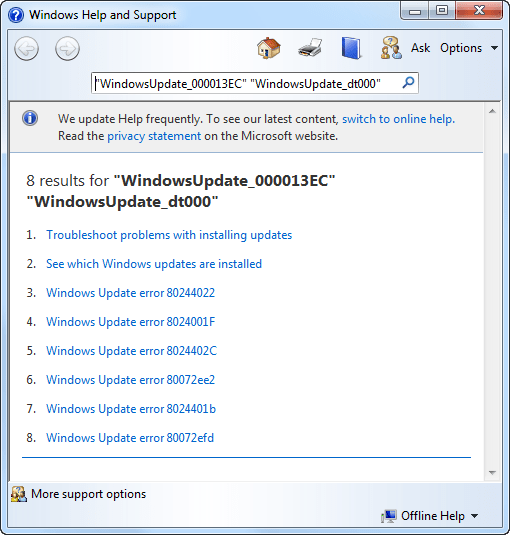 Like usual, the Windows Update help on Error 13EC is useless, see the below screenshot. 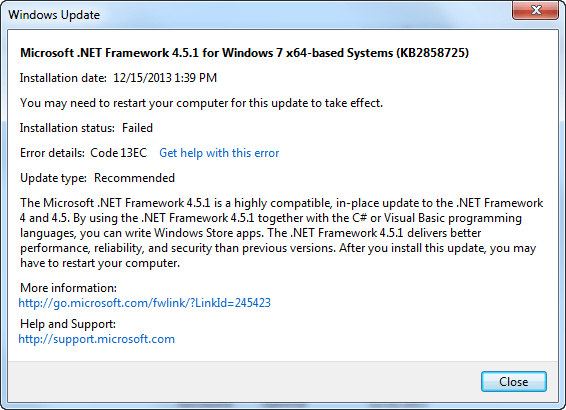 via: The .NET Framework 4.5.1 and its corresponding language packs are available on Windows Update.